To me the purchase of ‘The Clarets', as the official match programme was known, would have been like conceding defeat before the match had even started and there was no way that Mr Superstitious himself was about to do that. Thankfully for me I did manage to obtain a copy immediately after the match from a steward in the Cricket Field stand who had collected an armful of ones that had been either discarded or dropped accidentally by those desperate to get on the pitch at the end. 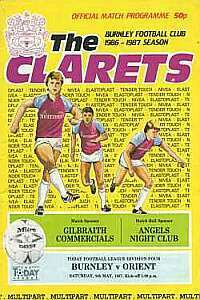 Those that bought them would have paid 50p for the privilege of owning the bright yellow publication adorned with 3 anonymous Clarets players that looked like they had been drawn by an ‘A' level art student. As a sign of how times have ‘progressed' the rear of the programme contained only 22 names. They just happened to be the exact starting line ups against the correct shirt numbers and I for one am glad that this crazy idea has been dispensed with. What it did reveal though was a fact that I had long forgotten about; the referee originally scheduled to take control of the match was not George Courtney. It should have been a Mr R Guy but given the importance of the match the Football League had replaced him with Mr Courtney who was one of the top referees in the country at the time. The programme itself (my copy has somehow survived in pristine condition despite it's less than auspicious start to life) was depressingly thin and was not exactly brimming with content but for all that it is fascinating to leaf through it again. Orient were given a warm welcome and we learnt that they were founded by the clerks of the Orient Shipping Company and once played at a ground called Whittles Whippet. Struggling for an identity they had been known as Clapton Orient, Leyton Orient and finally what they were called on May 9th 1987, simply, Orient. Then it was time for the obligatory adverts without which of course there would be no match day programme but answer me this. Why do printing firms always advertise in programmes? Do you know of any football fans that have ever had the need to employ a professional printing firm? Ever heard anyone go ‘Ah, Lords Printers, that's where I'll go for all those printing jobs I've been meaning to do but never quite got around to'? Whatever, if it pays for the programme, who cares? The important bit was ‘The Manager's Opinion with Brian Miller'. Brian had always been a fairly undemonstrative sort and his programme notes contained no inspirational rallying call to the players and fans just the calm and reasoned words that typified the man. He did have a word for the supporters especially the big followings who made the trips to Rochdale and Crewe as the season drew to it's climax and he finished with: ‘The support for the players has been greatly appreciated, believe me, and we know it will be there again this afternoon.' He was right about that but surely even he can't have imagined the near 20,000 crowd that did turn up. The middle pages contained photos of the goal action from the previous Saturday's home win over Southend United which in some ways was even more remarkable than ‘The Orient Game' as Southend were 3rd in the table and were desperate for the points to hold off a challenge from Wolves for the last automatic promotion spot. The Clarets even had to come from behind but a long range effort from Leighton James and a headed goal from Neil Grewcock (pictured scoring below) early in the second half put us 2-1 up and just maybe gave us vital experience of hanging on to a 1 goal lead as we repelled everything that Southend threw at us. 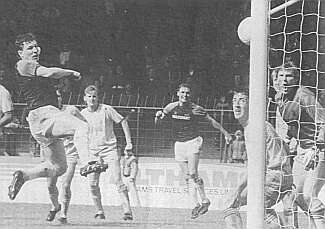 If anyone needed reminding of how rapid our fall from grace had been the very brief ‘Five Years Ago' feature recalled a 2-1 over Walsall at Turf Moor in 1982 with the Clarets fielding the following line up: Alan Stevenson, Derek Scott, Andy Wharton, Tommy Cassidy, Vince Overson, David Holt, Trevor Steven, Martin Dobson, Billy Hamilton, Paul McGee and Kevin Young. It was a team that would win promotion back to the Second Division and by my calculations contained 4 players who were, had been, or would be in the future full international players. In addition Stevenson had been capped at under 23 level, whilst we had Michael Phelan in the reserves with Lee Dixon to join in the summer. 25 years does not sound so long ago but the next advert was for a Canon Fax machine. As the advert said: ‘Put a miracle of modern communications on your desk'. Time passes and things change or do they? The next ad read as follows ‘Support the Clarets join Burnley Football Supporters Club today! For application form contact Mr T. Scholes (Secretary), c/o Turf Moor, Burnley.' The editor of this site doesn't need to prove his credentials as a loyal Burnley supporter to anyone but getting your name in the Orient programme isn't bad. It was even worse than that as since the programme was printed both Rochdale and Tranmere had won meaning that we couldn't catch them and we had the worst goal difference of all the teams down there. Survival was not in our own hands and we knew that even if we won a draw for Lincoln and a win for Torquay would have been enough to consign us to non-league football. I suppose they were right, ‘The Orient Programme' is a collector's item. Sure it is worth a few quid less now than it would if we had been relegated but that is sort of the outcome I was hoping for when I decided not to buy one. The thing is that the match made such an indelible mark on myself and the history of Burnley Football Club that I would not sell it for any price.